As investors, we know gold as a safe haven commodity with various relationships. For example, gold has a history of a strong inverse relationship to the United States dollar. The inverse relationship between the price of gold and bond yields in the United States is even strong. However, gold is acting very strange right now. At the end of the day, one of these relationships seems to be breaking down. Today, we’ll talk about what’s happening, why it’s important to pay close attention to, and what you should be watching for ahead. A tell-tale signal for what we can expect to see in the price of gold is yields on bonds in the United States. In particular, 10-year bond yields are the key figure to watch. At the end of the day, 10-year bonds and gold are in competition with each other for safe haven demand in the market. The reason is relatively simple. Gold has historically done well as a safe haven investment in times of economic and market concerns. During these times, investors tend to sell higher risk investments and funnel into gold as a way to keep their assets safe while the storm passes. While safe havens are important in hard times, it is also important to use them to balance a portfolio at any time. However, during tough economic times, bond yields are low as the Federal Reserve releases its interest rate. 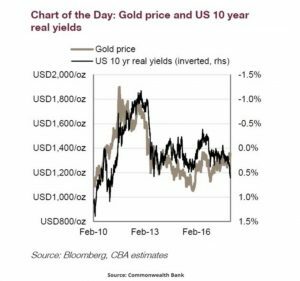 Therefore, demand for 10-year bond yields falls as demand for gold climbs. However, as the Federal Reserve increases its interest rate, 10-year bond yields start to rise. When this happens, those looking to balance their portfolios with safe haven investments tend to look past gold and move toward bonds. After all, in these times, gold generally falls while bonds generate a decent return on investment for a safe move. This is where things get interesting. Recently, Vivek Dhar, mining and energy commodities analyst at Commonwealth Bank, pointed out that the inverse relationship between 10-year bond yields and gold prices has started to break down. In fact, he provided the following graph that shows that while bond yields are increasing, the price of gold is still finding its way upward. Any analyst knows that technical analysis isn’t always perfect. In cases like this, we’ll see points in time where what cues like inverse relationships tell us should happen, isn’t necessarily what happens in the market. However, with experience, we learn that these things tend to work out over time. With that said, if history is any indication, and this trend continues, we could be in for a pretty large slide in the price of gold. After all, the market has a tenancy of balancing itself out. With gold rising along with bond yields, signs are pointing to a correction in the future. Moving forward, gold is likely to be an interesting commodity to follow. In particular, keep a close eye on the rising rates of US bond yields and how gold reacts. As the two continue to find their way upward together, it could be a signal of a painful correction in the value of gold ahead.